The following is a short excerpt from 50 Interviews: Young Entrepreneurs (Volume 1). Q: What challenges do you face specifically because of your age? How has your age helped you to succeed? A: Being young is a challenge in and of itself. Especially at 15 or 16, you’re going to be going through some of those awkward phases. Sometimes being young, being ambitious, and trying to do everything can hurt you. I remember at one point I was trying to do too much and spreading myself too thin. I was thinking about getting involved in real estate, trying to re-establish Fyt Ya, promoting my book, speaking, and going to school. All of that was just too much. As young people, that’s what we do: we think that we’re all superheroes and we can do everything. But you still have to have structure and focus on [what’s important]. My father taught me at a young age that it’s not what you know, but who you know. I get a lot of support because of my age. Especially as a young African American. People see that I’m trying to do something positive and help a generation. So professionals are willing to lend a hand and lend their advice. If I was 20 or 30 years old, they would be trying to charge me for that advice. A: I want to be a philanthropist. When people talk about Keith J. Davis Jr., I want them to say that he was a great businessman, but that he also did a lot for the community and for his generation. I want to be able to make a difference by informing, encouraging, and inspiring others. I want to leave a legacy. At some point I’m going to be working to get my real estate license. You build wealth through property, real estate, investments, and things of that nature. So I want to get into commercial real estate. We own a marketing research firm. I can continue to learn the business and, one day, take it over. A: You know what they say: if you love what you do, you’ll never work a day in your life. I’m in love with entrepreneurship and everything that comes with it. Entrepreneurship is where it’s at right now, especially with this economy. The unemployment rate is at 10%. As college students, we can’t depend on finding a job right out of college. So, you have to be able to create opportunities where there are none. 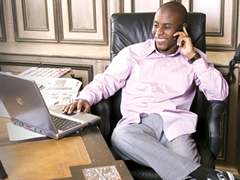 There is going to be an increase in individuals owning and operating their own businesses. Entrepreneurship is the key. Any time young people are doing something positive and spreading the word of entrepreneurship in our generation, I feel it’s my duty to help out. I’m just honored to be able to be a part of this program. This is an abridged version from Keith’s interview in our latest project, 50 Interviews: Young Entrepreneurs. The first words Keith ever spoke to me were “Mr. Nick”. This professional but personable approach epitomizes how Mr. Keith conducts himself as an entrepreneur. I don’t know how Keith finds time for all of the things he’s doing, but this interview will give you a glimpse of what it’s like to be an entrepreneur of all trades.